The New DJI Phantom 4 quadcopter is the smartest personal drone DJI has ever produced. 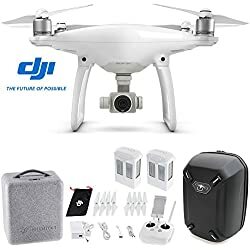 It offers great features that make flying fun and easy for most novice and offers professional pilots the tools needed for outstanding aerial photography and video. Already considered by many to be one of the Best New Drones for 2016. The most impressive feature has to be the Obstacle Avoidance in forward flight – this is a truly new and revolutionary feature that allows the Phantom to stop immediately if it senses an obstacle in front of it (hills, building, trees, etc.). 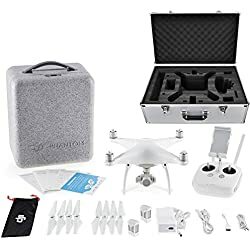 The DJI Phantom 4 drone can intelligently navigate around obstacles by using computer vision to reconstruct a 3D model of its environment and then use that information to avoid objects on the return home. DJI has also improved upon the Phantom 4 performance with a brand new lighter battery which allows for an industry first 28 minutes of flight time on a single charge. Other new features on the Phantom 4 quadcopter include raised motors for faster cooling, push and lock propellers, a sleeker body design to reduce drag, a pause button on the controller that will immediately stop any automated flight path. A new Sport Mode enables the Phantom to clock speeds up to 45 mph! The top speed on the previous Phantom drones was 37 MPH. The DJI Phantom 4 also has a new, lighter advanced 3-axis gimbal that takes out unwanted vibration and movement in-flight, enabling the camera to capture smooth and fluid footage. The Phantom 4 Obstacle Avoidance features a forward-facing vision detection system to sense and avoid obstacles that are about 3′ or larger. Two small forward facing cameras give it its own pair of eyes and an ability to not only see but react to its environment. In normal flight modes if it sees an obstacle coming close it will stop and hold position, and in other modes it will attempt to climb higher to avoid the obstacle. Tapping on the screen will tell the quadcopter to fly to that point in the distance. In TapFly mode, all you have to do is tap on the screen of your smartphone or tablet and it will begin to fly in that direction. To change the direction of flight, you can simply tap the screen to fly anywhere. At any point if it sees an obstacle along the way it will either avoid it or come to a gentle stop. Think of this as a form of “auto pilot” so you can focus on getting the shot instead of controlling the phantom. Visual Tracking is one of the most interesting features, While many new quadcopters are promoting a “follow me” mode, ActiveTrack is essentially “follow that” (boat, bike or car ect.). The technology uses an advanced combination of computer vision, object recognition and machine learning to allow the Phantom 4 to genuinely see for itself. To follow a specific person or object, Simply tap on the screen to lock on them and let Phantom 4 take care of everything else. The Phantom 4 will follow accordingly and keep the camera aimed at the subject. In TapFly, ActiveTrack and Smart Return Home modes it will fly around or over the obstacle, or come to a gentle stop to avoid a collision. It also gives you an audible and visual warning so you always know what is happening to the Phantom. What sets the DJI PHANTOM 4 apart from other Personnel Drones ? INTELLIGENT FLIGHT SUPPORT SYSTEMS – A duel satellite positioning system and an enhanced Vision Positioning System provides the Phantom 4 with a safer, more reliable flight experience. Intelligent Flight Modes include Auto takeoff, Auto return home, Follow Me, Point of Interest, Way points, Course Lock and Home Lock. POWERFUL CAMERA DESIGNED FOR THE SKY– Capable of taking 12.0MP (4000 x 3000) photos and capturing 4K ultra HD video at 30 frames per second and slow motion 1080p at 120 frames per second. The f/2.8 lens with a broad field of view delivers crisp, clear images, creating impressive footage has never been so easy. INTEGRATED LONG RANGE TRANSMISSION – See what the camera sees in 720p HD from up to 3.1 miles (5km) away with the Phantom 4’s integrated HD video downlink. Frame up your shot from far away with perfect precision. SPORT MODE – Once the beginner has mastered the controls of the flight app, they may be ready to give the sport mode a try. DJI recognizes that the Phantom 4 is of interest to the Beginner and the Professional. The Sports Mode is designed strictly for the Professional. For when you have a need for speed! A mobile device is needed to take full advantage of the phantom 4 features. While an iphone or other smart device will work, many prefer to use a tablet like the iPad Mini 4 for the best experience possible when flying. The DJI app work’s with most current IOS and Android devices. To add music, text, and more to your videos, You can use the DJI director software that comes with the APP, but most people just transfer the files from the SD Card to their computer and use there preferred editing software. A couple of well known editing programs are iMovie – (Mac) and MovieMaker (Win) along with GoPro Studio – (W,M) all FREE. Premium programs include Adobe Premier Elements and Cyberlink PowerDirector for more experienced editors. So now you know all about the NEW DJI PHANTOM 4 QUADCOPTER and all its new features. However, this technology comes with a price, definitely not cheap by any means. If you have the money and ready to get serious about aerial photography, this drone offers the latest DJI tech and a great choice for professionals that want the best tech available. 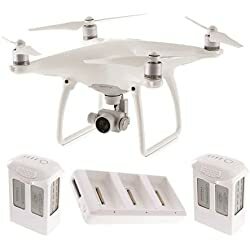 On the other hand, if you don’t have a fat bank account and you can live without features such as TapFly, Obstacle Avoidance and ActiveTrack, the Phantom 3 Standard is available at a much more affordable price and can provide better than average aerial photography.